Challenge book no. : 2/6, a book with a type of furniture in the title. It's been ages since I read a proper mystery, and this is definitely one of those. It begins, like several of Christie's other stories, with a dinner party that ends in murder. This is a murder-magnet tale, i.e. one of those Poirot books where he is present, or as good as, when a murder takes place and the police ask him to assist in solving it, but he is still the principal detective (of course). 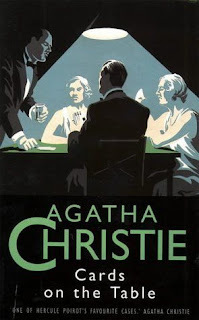 What's interesting about this story is that Poirot has no fewer than three Watsons to assist him, or rather: they work together to solve the case, with facts found out by each contributing to Poirot being able to work out the truth. Two of those Watsons, Colonel Race and Superintendent Battle, are also Christie detectives in their own right (the former in Sparkling Cyanide and the latter in The Secret of Chimneys, The Seven Dials Mystery and Towards Zero). The third is the delightful Ariadne Oliver, whom Christie partly based on herself. I have never hidden my dislike of Hercule Poirot, but here he is almost likeable, or maybe it's just that I haven't read any Poirot novels in several years and have forgotten what it was about him that annoyed me so much. The story unfolds with various viewpoints being shown, and Poirot being his pompous self. There are the inevitable red herrings and plot twists, some unexpected, some not so much, and it is, all in all, an enjoyable detective story. However, I have no desire to read it again, but I am keeping it because it's in an omnibus volume with four other Christie novels, two of which are among my favourites of her books. I'm thinking about perhaps setting out to finish reading the Poirot books, but it's just an idea at the moment. For now, I plan to concentrate on the two reading challenges I have entered, and keep at it until they are finished.